This the first of 5 segments being released over the next 48 hours. The National Homeschool Football Championship Series is honoring the top season performances by athletes across the nation, representing over 100 homeschool varsity teams. 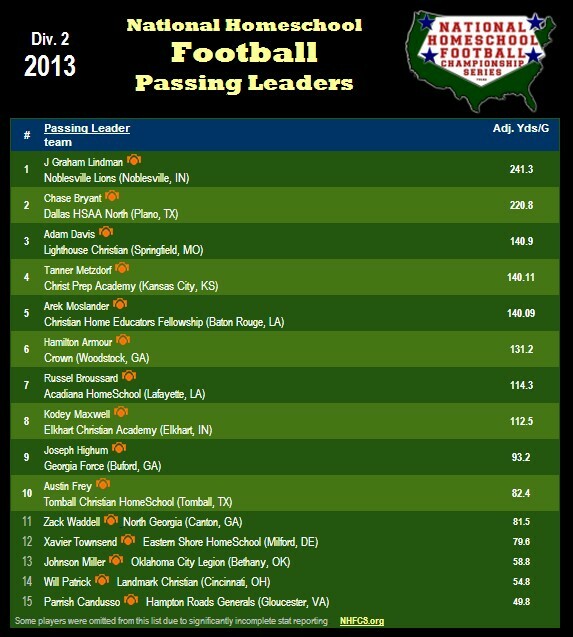 The top passers were determined by collecting and tabulating the team stats from games played up to November 10th, 2013. Teams are required to report game stats to the Maxpreps database. The tabulations were processed to determine the average 'per-game' performance, regardless of whether a team played 12 qualifying games or substantially less games during their 2013 season. The top 10 athletes will be awarded between 10 & 100 points toward the 2013 Offensive Player Of The Year. The other 4 categories are; rushing, receiving, scoring, and total yards.